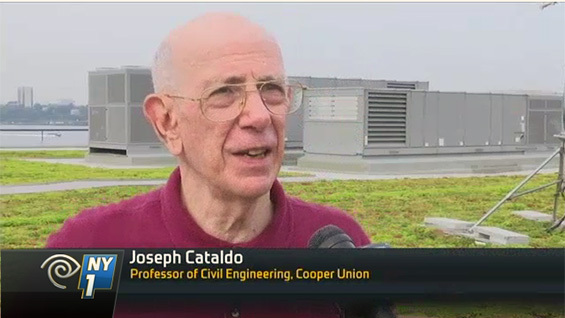 Joseph Cataldo, a professor of civil engineering who has taught at The Cooper Union for 40 years, appeared on NY1, the New York cable news channel, to discuss his research on the Jacob K. Javits Convention Center green roof. Rising civil engineering senior Dan Fagan, who works with Professor Cataldo on the project, also appears. The green roof is the second largest in the country, totalling around seven acres. In conjunction with Drexel University Professor Cataldo has been researching the effects of the roof on rainwater runoff and changes in temperature inside the building.